Scottish Fold cats coat colors are many and varied. Almost all colors are accepted, with the exception of pointed colors. That means a Scottish Fold should not have the “Siamese” look. Also no chocolate or lavender color is accepted (with or without white). These colors may appear every once in a while, because in the beginning stages of the breed’s development Scottish Folds were bred to several shorthair breeds; for example American Shorthair, British Shorthair, Burmese, Exotic, Siamese to name a few. The eye colors of Scottish Fold cats are bright and beautiful, even luminous. (Some have compared their eyes to those of Persian cats. which are traditionally admired as the biggest and most colorful.) The eye colors should match the coat color. These are solid whites, blacks, blues, reds and creams. There are no tabby markings or bars on legs. The nose leather and paw pads reflect the coat color. A chinchilla-colored Fold has white undercoat. Also the hair on the flanks is white. What makes this cat look quite elegant is the fact that the hair its head and tail (and sometimes also on the legs) are tipped with black, and this gives the cat a silvery appearance. The ear tufts, chin, tummy and chest of a chinchilla Fold are of pure white color. The nose, the lips and the rims of the eyes are all edged with black, but the nose leather itself is brick red – a very elegant combination. The paw pads are black. The eye color is green or blue-greed – a gorgeous contrast to the silvery coat. The shaded silver Scottish Fold is tipped like the chinchillas, but there is more of tipping. This makes the shaded silver Fold much darker than the chinchilla. A shell cameo Scottish Fold has a pure white undercoat. The head and tail are tipped with red (ginger) color. The nose leather, paw pads and eye rims are fittingly rose colored. In the midst of all the beautiful delicate red shades the eyes are of brilliant, lovely gold color. A shaded cameo is much darker than the shell cameo, because there is more tipping. But the undercoat is white just like a shell cameo’s. And here also the nose leather, paw pads and eye rims are of rose color, and the eyes are golden. A smoke colored Fold has a white undercoat and tipping just like the shells and the shaded ones, but the now each hair is tipped heavily with color – the color reaches further down each hair. So much so, that when the cat is not moving, it looks solid colored. But when it begins to move, the white undercoat becomes visible. This is quite a beautiful sight and makes you understand why this kind of coat is called “smoke”. A smoke can have red, blue or black tipping. The eye color is again golden. A tortoiseshell Fold has clearly defined patches of black, red and cream. The eyes are golden. A calico Fold has a white coat with patches of black and red. The white color should be dominant on the underside of the cat. And the eyes are golden. This cat looks the same as a calico with the exception that the black and red are diluted into their lighter shades: blue and cream. White dominates the underside again, and the eyes are beautiful gold color. A blue-cream Fold has a blue coat with well defined cream patches. The eyes are golden. A bi-color Scottish Fold has white coat with patches of black, red, blue or cream. The eyes are golden. Sometimes a bi-color may have odd colored eyes. 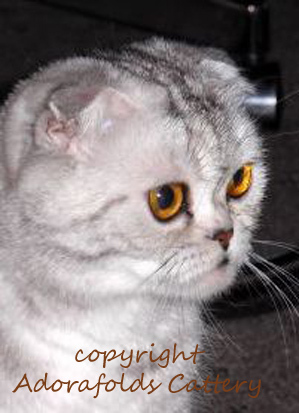 Do you have a good photo of a Scottish fold of specific Scottish Fold cats colors? A picture you yourself have taken and have the copyrights to? Would you be willing to have it published on this page? As a thank you I shall link back to your cattery website right next to the photo. Also, if you have not put your copyright info on the page, I will do that for you. This is such a rare breed it is a bit difficult to find proper photos of these specific colors, which is why I am asking.